The new Audi A6 offers an optional front lighting system from Hella KGaA Hueck & Co. featuring 64 LEDs. The system has been praised because it produces a light that is noticeably closer to actual daylight than other systems. This improves vision during evening hours and increases overall comfort and safety. The medium-premium car's LED headlamps automatically create light patterns that are adapted for a variety of driving situations. Specific settings are designed to reduce glare in fog or heavy rain and provide a broader spectrum of light than regular fog lamps. The LEDs also give the new A6 a distinctive look. The LED system is one of four lighting options that Hella offers on the A6. Delphi Automotive LLP supplies the A6's so-called "Connectivity Navigation Radio" platform (modular infotainment headunit). The system has made it possible for Audi to adjust its media center capability to address different needs, including the ability to add multiple digital tuner modules such as digital audio broadcast and multiple types of connectivity. The open CNR software architecture has allowed Audi to configure its vehicles to offer more than 20 variations of the new infotainment platform. 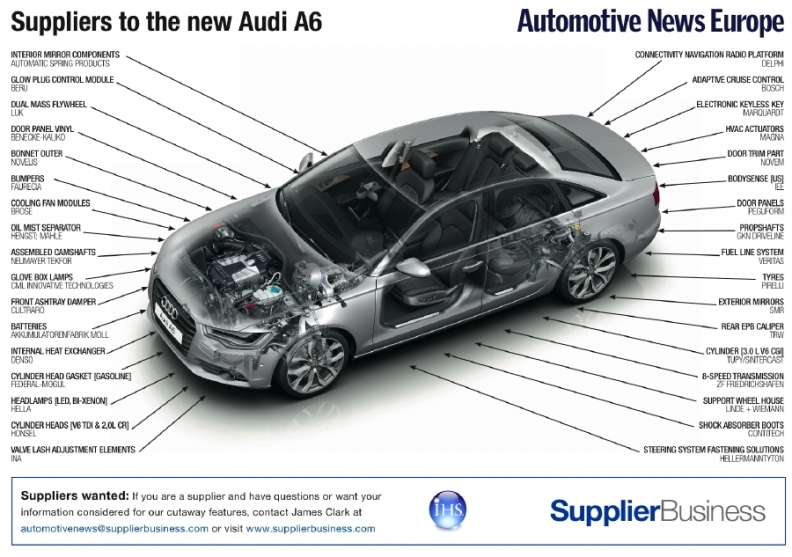 Delphi also supplies the A6's interior wiring harness and ultrasonic alarm sensor for the model. European production of the A6 takes place at Audi's Neckarsulm plant in Germany on the MLB B/C platform. IHS Automotive forecasts that production will peak in 2013 at 140,000 A6 vehicles from the plant.